No need to travel to San Diego or New York to get your dose of the convention scene. 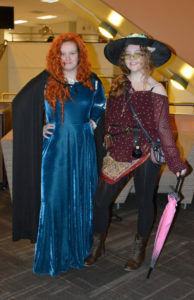 On Thursday night, RAH-Con took over the Chamberlain Student Center in a flurry of costumes, comic books and caricatures. The event, inspired by Comic-Cons across the country, offered Rowan students the opportunity to represent their favorite works of fiction. 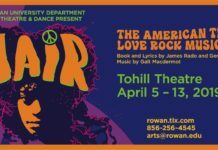 Pop culture merchandise was raffled off and a $100 prize in Rowan Bucks was awarded to the winner of a costume contest. Among the costumed was junior writing arts major Laura Kincaid. Kincaid’s cosplay of choice was Taako the Wizard, a character from a “Dungeons and Dragons” podcast called “Adventure Zone,” and was represented in an outfit including a brightly patterned shirt, tinted circular glasses, pointed hat and various gemstone pendants. 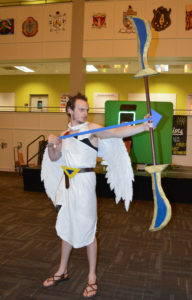 The student dressed as Kid Icarus, sophomore theatre major Nathan Benson, ended up victorious in the costume contest, taking home the Rowan Bucks. Junior musical theatre and history major Laura Foley went as Princess Merida. Foley’s costume, complete with bright ginger wig, rendered her the likeness of Disney’s “Brave” heroine. For students not participating in the costumed events, there was a velcro climbing wall to scale, airbrush tattoos and a midnight food bar sampling selections from the Philadelphia Pretzel Factory. The DIY craft of the night allowed students to make comic book letters by pasting comic cutouts to the surface of wooden letters. Overall, RAH-Con provided a fun microcosm of Comic-Con, replete with recognizable costumes and comic-themed events. For questions/comments about this story, email arts@thewhitonline.com, or tweet @TheWhitOnline.